Experience the majestic allure of the unspoilt Eastern Cape in a luxury Lodge, where your body and soul will be revitalized. There is a glorious world out there, just waiting for you to come and explore! We know what the everyday hustle and bustle of modern life take out of you. All you need is to break away to a utopian setting where the marvels of Africa are at your feet. Escape from all the deadlines, meetings and contracts due by three and let us treat you to something which is Simply Exceptional. Let us invite you to come and stay at Parkview Lodge. Set between the meandering Sundays River and the gleaming Indian Ocean, lies Parkview Lodge, an 85 hectare estate comprised of diverse environmental landscapes and home to a range of local wildlife, including game drives in the reputable Addo Elephant Park to experience the legendary Big Five. Located just outside the margins of Port Elizabeth, where rolling grasslands, fynbos covered slopes, and illustrious coastal forests meet. Parkview Lodge offers its guests, the restorative experience of a lifetime. At Parkview Lodge, you will step into an Out of Africa experience, filled with all the luxuries and indulgence that will make your experience truly memorable. Choose to stay in one of our 3 Guestrooms in the Main Building, which have a TV installed, for those who still want to keep in touch with the outside world. For the more adventurous at heart, we have five tented rooms, set in the more verdure part of the estate. Professional chefs will treat the traveler to unique cuisine from our fully equipped kitchens. Parkview Lodge also offers something the early explorers never had but is essential to any African Adventure: Spa and Beauty Treatments! Trained technicians will pamper you in the privacy of your own room, just to make your day that little more exceptional. Depending on the time of year, our guests can lounge by the pool, sipping cocktails and enjoying some justified leisure time. 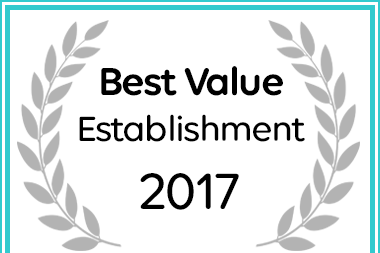 Parkview Lodge has received a Best Value award for 2017.